Focussing on the level of activity in the retail sector – rather than growth rates – can provide a fresh perspective. 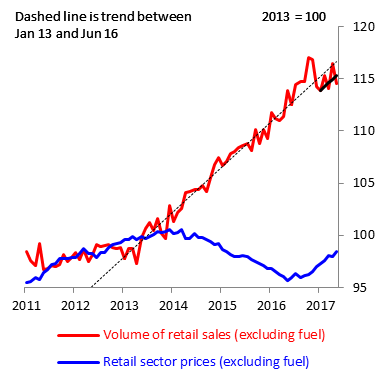 From around the start of 2013 to the middle of last year the volume of retail sales trended steadily upwards. And, for much of the period, prices were falling back. But in the second half of last year, retail sales picked up markedly at the same time as prices started to rise. So perhaps it should come as no surprise that retail activity corrected sharply around the turn of year, falling back to a level that’s below the one implied by its previous trend. Since then, it looks as if retail sales’ trend has, broadly speaking, restated itself. The question is: as prices have continued to rise in 2017 can that trend be sustained? Matthew Swannell works in the Bank’s Conjunctural Assessment and Projections Division. An interesting starting point. Have you looked at any potential differences between types of retail sales – does food & drink behave differently to other non-essential items?